In this video I'm going to walk you through transferring a domain name from GoDaddy to Wealthy Affiliate SiteDomains. This has nothing to do with DNS or changing the name servers. It's for when you've bought a domain name at GoDaddy and you want to transfer the registration of your domain name to take advantage of all that WA has to offer as a domain name registrar. Before transferring on the GoDaddy side you MUST disable domain protection and privacy (if you paid for those services when originally registering the domain) - BOTH. If you don't and you start a transfer it will be automatically refused - you will get an email from GoDaddy. This causes the transfer on the WA side to get stuck.... And there isn't a way for you to update the Auth code to restart or to cancel the transfer and re do it. As always, I'm here to help you. Thanks Marion for this tutorial - it really helped. Seems like GoDaddy goes to great lengths to make transfers difficult / obscure. Even their own documentation isn't complete / clear. I am trying to get WA support to understand this and stop the attempted transfer so I can restart with a new Auth code from GoDaddy after disabling both domain protection and privacy. This is my first experience with WA technical support and it seems like they don't have time to read the messages and troubleshoot - just reply.... Very frustrating. Also I noticed that some of the screen were different I never received an email to confirm the transfer or that I had to click a link in. But regardless - all the steps in your tutorial are still relevant and in the right order it seems. Thanks again for sharing! It's been a long time since I registered any domain names using GoDaddy. It's much easier to have them all in one place. I'll add your info into the text above. Thanks for mentioning the problems you've experienced. Thanks for this tutorial,Marion. I'm having trouble transferring a domain name into WA from HostPapa(which I think is part of GoDaddy?). I have the from HostPapa, but it is not being accepted when I enter it in the WA form and I can't get any further. Hosting for that domain has now lapsed at HostPapa, so I'm not sure where to go from here? Any thoughts anyone? I've just bought a domain from godaddy. Could you please explain what are the advantages of having the domain on WA? I plan on WA hosting my website, and I wonder if I should just wait until my year at godaddy is finished to transfer the domain to WA. But most importantly, I would like to know what advantages are there when doing that. Thanks! I would wait for 10-11 months (instead of a full year) to transfer the domain name to make sure you don't run out of time. It can sometimes take longer than expected for the transfer to complete. WA is cheaper for renewals and provides private registration for no extra cost. Ok so the advantages are it's cheaper for renewals and no extra cost for private registration. Go daddy didn't charge me for private registration as it showed me a message that I am already protected as I am in the EU. Transferring your domain’s registration to another registrar is one thing, transferring of the hosting for your site is another thing. If you host your site on WA, you get all the features I mentioned in my previous message. Hope this clarifies that and helps. Exactly. You'll most likely find that renewing your domain name at GoDaddy costs more than the initial registration whereas WA has the same price locked in. Yes, the hosting is separate to the registration of the domain name so the features of WA hosting will apply to all websites hosted here regardless of where the domain name was registered. Marion, very informative. I just spent an hour trying to navigate Go Daddy. I have three domain names that I want to transfer to WA. Their DNS all point to WA, but I have only one that WA can verify. I'm going to seek help from Site Support instead of bothering Kyle. You answered a lot of my questions years ago. It's good to have your knowledge again. Marion, thank you for your comment. I went to site support. They didn't have answers for my situation. I have three domains with Go Daddy. Go Daddy said they are pointing to WA. I need to transfer about five websites to WA from HostGator. I see that I need to get a code from HostGator and give it to WA. Did you ever have to do that? Yes I did Chuck, it was a long time ago. You might have to look at their help files to see how it's done there. I can't remember if it was GoDaddy or HostGator, but one of them really drag their feet when it comes to transferring domain names so make sure you give yourself plenty of time. Thanks Marion, your video was incredibly helpful. Even though I was transferring from Domains from Siteground (rather than GoDaddy) to, I was able transfer successfully. I wonder if things have changed from Wealthy Affiliate? QUESTION: I never got any email from WA, all I could see was to accepting the WA Terms and Conditions at the point of payment (https://www.wealthyaffiliate.com/legal/domain-terms). I accepted these terms and conditions and the Transfer was in progress and completed "Transfer Successful" the next day. So has that process from WA changed? OR is there something I has better do? It sounds like the process has changed a tad, John. I haven't transferred a domain name for ages because they're all here now. Even after disabling the domain lock option, Godaddy keeps telling me the transfer-out option is disabled. Same goes for other options, like requesting an authorization code, transferring the domain to another Godaddy account or deleting the domain. Any idea on how to sort this out? I am also not allowed to disable the auto-renewal option, but in this case I am asked to contact their customer service team. If the domain name is less than 60 days old then you can't transfer the registration. You should be able to point the DNS (domain name servers) to WA at any time. WA Hosting - Setting Up Your Domain DNS Contact GoDaddy support as they are the only ones who can tell you what's going on. Thanks for your prompt reply, Marion. The domain is 2 years old actually, and the dns were pointed to WA long ago. That being said, I think that GoDaddy are the only ones who can shed light on this. Did you remove the privacy? If privacy is enabled then they can't confirm your email address so they can't send you an email to initiate the transfer. @MarionBlack Are you talking about the domain privacy? If that is what you mean, no, I have not removed it. I have also posted on GD forum for further help. I will keep you all posted, in the hopes that I can be of help to other members being in the same situation. @MarionBlack All sorted now. The problem was I had not completed my setup process. I thought the two-factor authentication was optional, so I had left it blank. It turned out that it was mandatory in order to transfer a domain out. Now, I have to wait for 72 hours before being allowed to. Again, thank you very much for your time and replies. GoDaddy makes it as difficult as possible to leave their hosting. You will probably have to directly work with there tech support which in my opinion is awful. Good Luck. My experience with Godaddy was years ago when I was first starting. My website was fairly new and not yet drawing traffic so I just abandoned it and started over with a new URL. All other websites I have worked with make it relatively easy. The internet is full of horror stories about trying to leave Godaddy. Good luck. Patience and determination should prevail. Absolutely true. I had not provided any further updates, but the reality is I had to wait for 18 more days (3 days anyone? lol) before finally being able to move my domain to WealthyAffiliate. I am a friendly guy but the amount of hitches and excuses I had to hear was beyond my patience. I did fancy abandoning it all, but the thing is my domain name is very catchy and just could not afford to lose it. So I put on a bitter smile and waited. I am not one to forget anyway, so once the transfer out was finally complete, I immediately deleted my Godaddy account. Total transfer time: 22 days. Thanks Marion! I hadn't done this for a while and your video walked me through this today! i purchased a domain in godaddy and i followed your steps to remove it but i find this Transfer domain away from GoDaddy (disabled) writting on the settings can you please help me? A new domain name cannot be transferred to any other domain name registrar for 60 days. You don't need to transfer the domain name to have your website hosted at WA, all you need to do is change the nameservers. Only premium member of WA can have their own domain name website hosted here. thank you for your answer,do you know if it's possible to use the website builder on my domain as a free user? The GoDaddy website builder is only available at GoDaddy. Wealthy Affiliate uses WordPress which is the most popular content management system in the world. Can I change Sheriis4U to somehing else? If you mean your Wealthy Affiliate username then you can change it to something else from your Account Settings. Choose carefully because your username can only be changed once. Thank you for the information and the video. I just joined Go Daddy in October, so is it okay to change to WA. I believe it was only $15 for the year so it's not a big loss financially. I have canceled lead pages and click magic. Next, I have to cancel gator host and get responder. Once I do all these things my website will no longer be active. 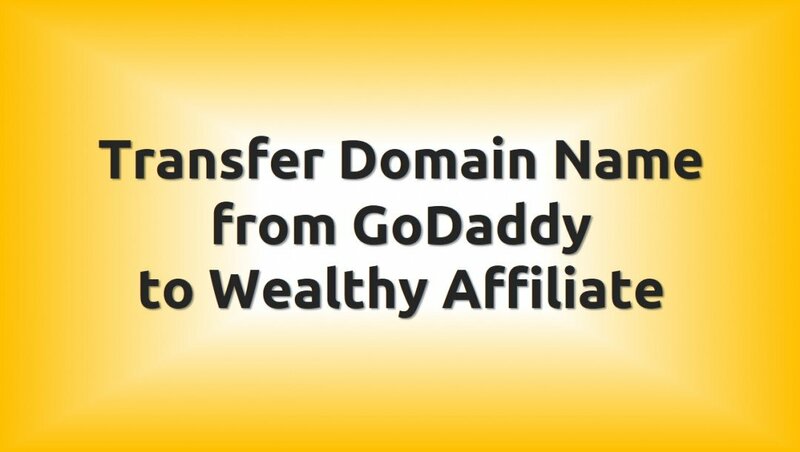 From your knowledge will I have done everything I'm supposed to do to transfer this Go Daddy domain to Wealthy Affiliate? I appreciate your advice and I thank you in advance for any that you have to give. Take care of yourself talk to you soon. This training is about transferring the domain name only, not the website itself. If you have any content on the site then you need to backup and save the files on your computer then upload them to WA for hosting. Full Backup With a Plugin You don't need to transfer the domain name to have your website hosted here. I have just successfully transferred a domain from GoDaddy - it worked exactly as you said it would. The domain was ready to use at WA in about 15 minutes. Just as well John. All my domain names are now registered through WA so I can't go through the exercise of transferring them from GoDaddy again. John, you don't seem to have a lot of content as yet which could be the main reason you're not getting traffic. Think about the problems that people may have with French Bulldogs as pets and how you can help solve those problems. When people search the internet it's because they want to find information or solutions to their problems. As 'webmasters' it's up to us to provide that information and solve those problems. I am very new here, but I am still an affiliate at another place where you can actually BUY traffic. To any website or blog. I have gotten many of my signups that way. Now at that website I would not be allowed to post a link and I can imagine it might be considered spamming and I really don't want to go around breaking any rules. So please tell me whether I am allowed to give you a link, or whether you can maybe email me, or what are the rules here? I'm glad you asked :) There are very strict rules here about sharing links and promoting things either in blogs, comments or private messages. Here's the link to the rules: Spam is a NO NO! A couple of my domains were just renewed for two years on Go Daddy. Apparently they have an apparent default for two years. If I transfer to WA, will my two years transfer also? Only if you change registration services from Go Daddy to Siterubix. You can keep them registered at go daddy but point them towards Siterubix for hosting. When you transfer the registration you'll have to pay for one more year which is tacked on to the registration you've already paid for. If you don't need to have the registration for three years right now then you can change the nameservers and have the sites hosted here. Before you do that you'll need to backup the existing files and database. Full Backup With a Plugin How to Back Up Your Website With FileZilla via FTP If you use FTP then use WP DB Backup plugin to backup the database. Can the domain name be changed once it is transferred? Yes however you need to purchase a new domain name. You can change it as often as you want but do it now while you don't have all the traffic established. Your info worked great with my 1&1 account. Different interface, but it was actually much easier because they didn't have to email me anything. They just gave me the authorization code! We are still on the "transfer in progress" part though. I hope I've done everything right. Can't wait to drop them! The GoDaddy interface has changed a little, but, your video helped me get through the process (I think). Transfer still in progress so just waiting to see if all went well. Thanks for making this helpful video! Update: Transfer just went through. Thanks Marion! Thank you very much, Marion. Everything seems to be going according to plan. Problem resolved. Hi Miriam after watching your video, I feel very confident on transferring my domain name. However this is probably a dumb question but how do I get the rest of my website over to wa? You'll need to do a complete backup of your site then ask Site Support to help you with the move. Thanks my site has been moved. Hi Marion, thanks for this tutorial. Very helpful. I followed your step by step tutorial but I could not go any further. after entering my authorization code, I got a message that WA does not support the ca domain extension. Thanks Marion for your help. That training was helpful. I've moved the site over now. Thank you so much! This article was most helpful! If I want to transfer the domain and change the name servers, does it matter which I do first? The site is hosted at GoDaddy and built in Dreamweaver. The site was built by someone else for a non-profit org. I might be taking it over and I want to work on it here in Wordpress. There's going to be a lot of changes to the website and I can't decide if I should transfer the domain and start a new site (if that's possible) or transfer the whole site and make the changes. If the site was built in Dreamweaver then it's HTML. Transferring an HTML site to WordPress is not an easy task. Changing the nameservers would mean you'd have an empty website as the files are stored on GoDaddy's servers. The best way forward would be to leave the original site at GoDaddy and copy and paste the pages into a WordPress site. Only after you have the new site up and running as you would like it to be would I change the nameservers. Then you can use the WA "Move" tool to transfer the site to the domain name. Finally you could cancel the hosting account at GoDaddy and transfer the domain name to WA. Great. This helps a lot. I forgot to mention that they want to keep the same domain name, which they just paid for in Feb. I was originally thinking of copying and pasting but I didn't know how to keep the same domain. 1. Start a siterubix site and copy and paste into it. 4. Transfer domain name to WA. Thanks so much for your help Marion. 1) How long would you say it takes for these transfers to happen? 2) If my domain name is purchased on Godaddy, but the domain is hosted on WA, does this affect the process you outlined above or is still the same and will work fine? 3) If I have both my domain name and hosting for that domain name on Godaddy, will I need to first delete the hosting on Godaddy, then transfer the site? Or do I have to just transfer it, cancel the hosting on Godaddy and put it up on WA? 1) You can speed the process up by responding to the email which GoDaddy says you don't need to respond to. So that means it can take anything from one to five days. 2) It works just fine. The hosting company information (DNS) doesn't get changed when you transfer the domain name. I have my sites hosted elsewhere but the domain names are now registered with WA. 3) The website's files (posts, pages, media) are sitting on GoDaddy's servers. The first step is to do a complete backup and save the files on your computer. Then contact Site Support and ask them to help you move the website. Finally you can transfer the domain name and cancel the hosting account at GoDaddy. Good morning Marion. Sorry, I'm still not clear about something. Is it true that I have to wait 60 days from the registration date to transfer my domain? You can change the DNS to point to WA's servers immediately to have your site hosted here. But if you want to transfer the registration of the domain name to WA then you'll need to wait 60 days. I cancelled my Wealthy Affiliate last year ...and I am just now getting it started again. I guess I lost all my work from the websites I built. I dont know how to get them back. Any help with would be great. Most hosting companies don't keep a backup of websites after the subscription is cancelled. WA is different and they may still have a backup of your website. Please contact Site Support and ask if they still have it. I realized I miss spelled my domain name after I completed the transaction. I did have the correct transfer code. What will prevail, the bad spelling or the transfer code? The transfer will probably fail. If that happens you'll most likely get a refund so you can start again. Marion---thanks for the clear instructions on moving my domain. Your tutorials are always so easy to understand and follow. Nothing like serendipity! I happened upon this and need it TODAY! 2. Clicked Website builder on WA and chose "on a Domain I own"
Is that all we need to do? or anything else I have missed? You have just made me fell confident in transferring my GoDdday site to WA. one question, I use the sites email from godaddy, will it transfer too or will I need to set up a new one? Transferring a domain name does not transfer your website. Your domain name is the registration of the unique name that your website is called by and used in the address bar of your browser. Your website is all the files that make up what people see when they type in the domain name. Your email address is set up wherever your hosting is set up. If you choose to move your website's hosting to WA (or anywhere else) you would have to set up your email address(es) wherever your website is hosted. You can have your domain name registered at one registrar and your website hosted at a different place if that's what you want. To transfer an existing website (not the domain name) you would have to back it up to your computer and contact Site Support to help you move it. Many thanks Marion for your tutorial. WA - this is what it says on my hosting page. Yes. WA is a reseller for Enom. Thank you. I followed directions but I get an error avout something went wrong and cannot verify contact. But my contact info is correct. What are the exact words in the error message? Oh no, something went wrong with your transfer order and we were not able to set the contact details for domain isuperlikeit.com. Are you trying to change the contact details? You can't transfer a domain name within a certain time frame of changing some of the important details (I think it's 2 weeks). Contact GoDaddy's help support. You don't have much time left before you need to renew the domain name. It expires on December 17. Thank you Marion, I left everything to last minute and well, I freaked out so I just renewed the domains with GD and will point them to WA instead. I'll be more diligent next year. Thanks for all your help. Thank you for this training Marion! Thank you so much! It helped a lot. I'm glad I could help Lana. Currently I am a premium member and just bought a godaddy domain not realising it does not include hosting. They wanted me to pay $80 for the full year, I laughed. 1) By doing that do I have to have it as a wordpress site or am I still free to use Dreamweaver to upload my fully built site? 2) not saying it will happen but I like to know my options, if i decide to no longer be a premium member on WA and go back to free member, i assume I lose the hosting option with WA. Am i free to go elsewhere for hosting my site if I choose to keep the domain? If it's less than 60 days since you bought the domain name you can't transfer the registration. You can have the website hosted here immediately using your domain name that you have registered at GoDaddy. If it's an empty website you just need to point the domain nameservers to WA. 1) I don't know. You'll have to check with Site Rubix Site Support about using Dreamweaver. Thank you Marion, this was very helpful. Always happy to help Kevin. Marion, I just bought a domain from godaddy and your telling me that I will have to pay to transfer that along with my purchase price? Ill be going back and forth with these instructions! i thought it was a good thing I bought it but not so sure now. You can have your website hosted at Wealthy Affiliate without transferring the domain name. Kyle explains it for you Connecting Godaddy Domains With WA Hosting WA Hosting - Setting Up Your Domain DNS Wait until a month before your domain name registration is due for renewal before transferring the registration to WA. Nevermind I just read further and I think I did it right. I used the link in siterubix. Thanks for the info and I hope I did it right. I'm always happy to help Gary. Hi, I don't have "Domain Transfer" on my settings page. More wisdom on how to go about it? Domain Transfer is under Site Domains on Site Rubix. Click the blue Site Rubix button on the left and you should see Site Domains. 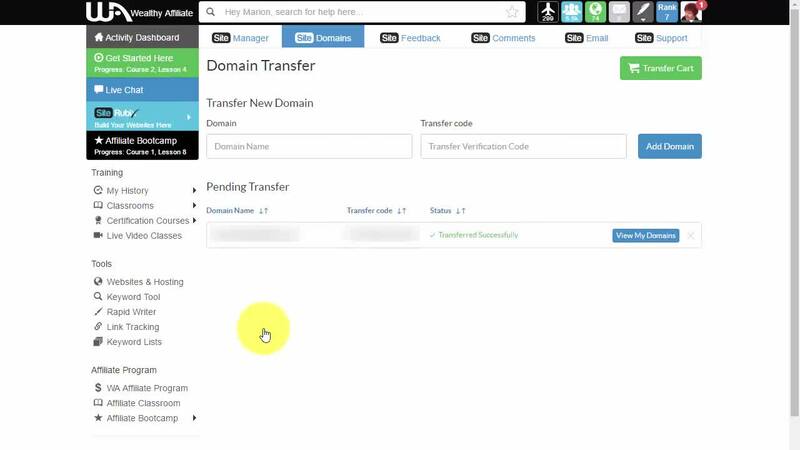 Click on Site Domains and scroll down to find Domain Transfer. Just follow the video. Hi, Marion! I used this tutorial again to transfer another domain to WA. It works great! FYI - GoDaddy did change some of their screens so they don't exactly match the video anymore. They probably knew you had this great video that makes it easy to take business away from them and they got ticked off! LOL!! Anyway, no big deal. People just have to be aware and they will find the options you refer to. I watched it myself not long ago so I could remember how I did it. Do you know if people have to be a paid WA member to transfer to/buy domains from SiteDomains? Anyone can buy or transfer a domain name here. They don't have to be a premium member. But if they want to have a website hosted here using their domain name then they need to be premium. OK, thanks Marion. Very helpful vid! This is awesome Marion! I have several domains expiring at Godaddy and they want $70 for one year! Not a chance!! I know I have needed to do this. I have no plans to leave WA and my websites being hosted here! So I went searching for your post as I thought I had seen it once before and you came up first in my search. $70 sounds a bit much. What extensions are they? Dot coms are the cheapest. And not all extensions can be transferred to WA. My dot co names are OK but some of the obscure ones like dot club won't make it so check first. They are dot coms. It's okay though. I want them transferred to WA and have two of five done. The whole process took about two hours waiting for the emails to come through and the responses to take effect. They are now transferred and no longer at Godaddy. Your instructions worked perfectly! Thanks again!! great video, thanks a bunch , Marion, it is very quick process, it looks like. Not quite as quick as the video :) You have to wait between the emails. It may take a couple of days. Will the website be still active? Yes. Transferring the domain name has no effect on where the nameservers (DNS) are pointed. Thank you Marion for your quick and concise training video! Another really cool video training from my favorite Techie. I've got some domain names over at NameCheap that I want to transfer over to WA. I suspect the process is pretty much the same ... right? So I do not know where Im stuck now. You have to cancel the privacy before you can change registrars. It will only be until you've finished transferring the domain name then you'll automatically have privacy again. Wow, this is not at all how go daddy told me to do it. I will redo it your way. Thank you for the great information here. Yeah, their information is way out of date. And it held up my transfer till june 18th. Ugh. I love your videos, much more simple than the ones others do. I have a question, i never set up my email here so iam doing it now. Question is the domain dropdown does not show my site and wont let me just type it in, any suggestions? If your domain is hosted here it should appear in the drop-down list. You can't set up email for a siterubix subdomain, only for domains which you own and are hosted at WA. So I wont be able to get email until go daddy transfers my .com? I did get a authorised code, will that help getting my tranfer done? Yeah, it should. Did they explain why it's held up until June 18? No they didn't. I just put in the transfer and this code and it says now transfer pending. You should get an email like this. Then you have to click on the link in the email and go on from there. The email will be sent to your email address on record at GoDaddy. Ok, guess I will have to wait. Thank you so much. Have a nice weekend. I would like to know how to do the opposite... Transfer from WA to another name server.... Any help? If I transfer domain registration from godaddy to WA, do I get the privacy feature? Yes privacy is included BUT if you've only just bought your domain name then you'll have to wait 60 days before you can transfer registration. Thanks again, Marion. Very clear and concise as always! Thanks for the great tutorial, Marion. Great information Marion! Can you create or point me to a process as clear as this for transferring from Name Cheap to WA? I would be indebted. Thanks. Sorry, I can't help with Namecheap. I've never bought from them. But they should have some help files or videos on their site. Thank you Kyle. Now to go about this. When you've got it figured out you could make a tutorial to share with the rest of our members. It should be interesting. the first step is to recognize that Name cheap has 2 factor authentication to get into their site. I'll need this as a reminder for myself when the next domain name is coming up for renewal. Thanks Marion, now I need to figure out how to do this with namecheap as that is where my domains are registered. One question though, do the renewal dates stay the same after the transfer? I just renewed one of my domains so I don't want to have to pay for it again when I transfer. The other ones are up for renewal in the next 3-6 months. Yes, part of the transfer process is to pay for an extra year (or more). I'm transferring mine around a month before they're due for renewal. Sorry, I can't help with Namecheap. I've never bought from them. But they should have some help files or videos on their site. Kyle has just chimed in with some help re Namecheap. Look for his comment above. Thanks Marion. I will wait till the domains are up for renewal before I transfer them. I had a quick look at namecheap after leaving my comment here yesterday and it seems pretty straightforward. Found what I needed right away. That's great. Just give yourself enough time because it takes about a week and you don't want it to expire. Transferring the domain name adds an extra year to the registration. Sounds good. I will keep that in mind. Is this a relatively new feature Marion? I tried to do this earlier this year and was told it was not possible at the time. Thanks for a great tutorial. Yes, it's new and very welcome. Thank you for sharing ,Marion. Good material. Marion.....I wish I saw this video yesterday! You answered lots of questions. Thanks! Thank you so much Marion!! I'm changing mine tomorrow first thing in the morning!! I'm so excited! Thanks Marion. Would other places we originally purchased domain names transfer in a similar way? I'm sure they would all go through a similar process but where to find the various things you need to do would be different. They should have help files or videos. I couldn't believe my eyes when I saw what your tutorial was about. One of my domain names at, GoDaddy, is up for renewal in June. Now I'll know how to transfer it without messing things up. Thank You So Much, Marion. You're the best. Make sure you give yourself plenty of time to change over before the renewal is due. It seems all registrars make it look harder than it is. I persevered with moving from GoDaddy. I wasn't easy trying to figure it out from their "help" but once I did it I thought I'd better share. The steps for moving from register dot com should be similar so keep trying. Marion, do you know if it would work the same for Host Gator? This is the training for transferring from Hostgator: How to Move Your Website From Hostgator to WA Hosting? Every registrar is different. They all should have help files and/or videos, just some of them make the move seem harder than it is. Thanks Marion. The next time I see this question from a newbie I'll know where to look to help them! No, I've just started pulling up your name first for these kinds of things when someone needs help - you're one of my top "go to" people Marion! Sorry for the late reply - I've been without my computer all week! I know, I remember thinking "how horrible" and then just a few days later it happened to me! UGH! Marion, Can you tell me the advantages of moving my domains from other registration companies? I have several domains at other companies which also offer affiliate programs. Their yearly fees and the cost to purchase a domain are a little less than WA. So I am trying to decide if moving them would be the right thing to do. Thanks for all your help. 2. One click login to your website without typing your Username and Password. 3. You can also promote the webhosting company where you registered your domains. 4. All of the work like trainings, editing your content, blogging and etc. you can do all that in 1 Place. That's here in WA. WA SiteDomains cost structure includes privacy so your name, address, email and phone number are protected. Carson explains is better We Have Changed the Domain World for the Better. SiteDomains. Thanks Marion, I have one domain that I pay $7.00 to host.. My understanding is I can transfer that domain to WA and it will be hosted free.. Saving me $7.00 per mo. Is that correct. Yes, hosting is included in your premium membership. How awesome is that! Thanks for this info... I am going to start moving all of my domains and the one hosting over.. Thanks again! 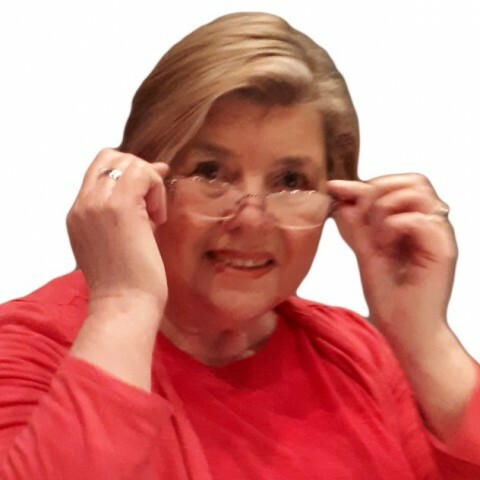 Thanks Marion for this good training, Although my purchasing WA new domain issue has not been resolved , I sent Email to both Kyle and Carson seemed they are so busy! It always takes longer to get a response at the weekend. Thanks for watching the video.